Hundreds of fighters evacuated by the Syrian regime from their bastion near Damascus arrived in rebel-held Idlib province on Friday, a monitor said. 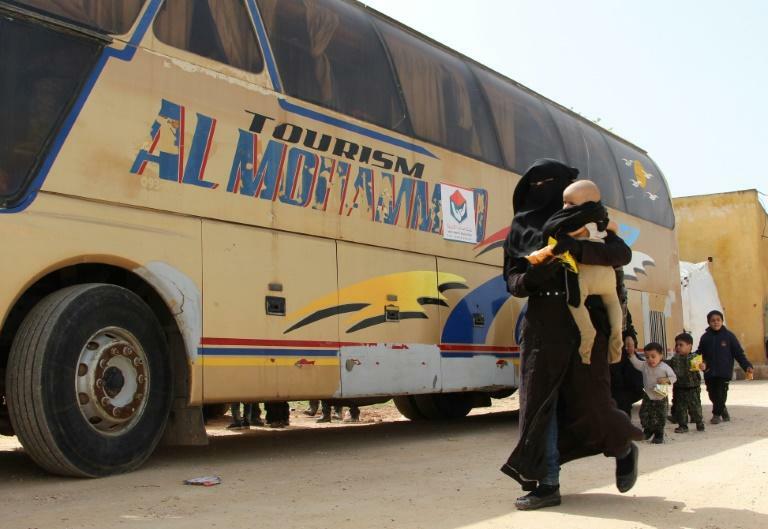 Buses carrying the fighters and their families entered the northwestern province after their evacuation from the rebel-held town of Harasta in Eastern Ghouta on Thursday, the Britain-based Syrian Observatory for Human Rights said. An AFP reporter at a camp for the displaced in the Maaret al-Ikhwan area in the north of Idlib province saw some of the evacuees arrive. Families entered the camp but the fighters were not allowed in, he said. Abu Zayd, a man who had just arrived from Harasta, said he was grateful to be alive. In Harasta, "we were already dead, buried underground," he said. The camp's manager said volunteer teams had devised an emergency response for around 2,000 people, with a field kitchen, mobile clinics and a round-the-clock volunteer team. Buses arrived outside the camp, one with small children peering out the window. Men -- some carrying guns -- women and children stepped off the buses and collected bags from the hold. A woman held a new-born child in warm clothes, wrapped in a mint-coloured paper sheet. Before dawn, some 400 fighters and hundreds of civilians on buses and ambulances had stopped in the town of Qalat al-Madiq in Hama province to the south, the Observatory said. Among them was a man who had died of his injuries on the way, said the monitor, which relies on a wide network sources inside Syria for its information. 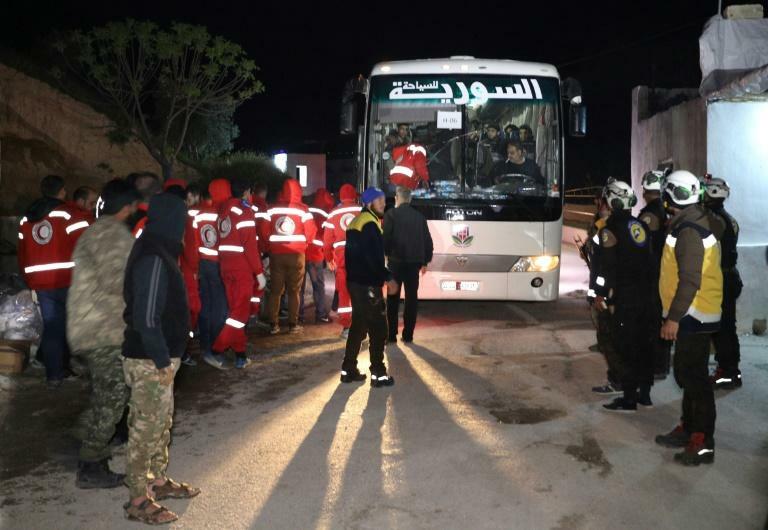 The AFP reporter saw hundreds of people arrive on buses in Qalat al-Madiq, where rebel fighters and members of the Red Crescent and the White Helmets civil defence organisation were waiting. The evacuation from Harasta comes after pro-regime forces launched a blistering air and ground offensive on Eastern Ghouta, the last rebel bastion near Damascus, on February 18. The assault has retaken 80 percent of the enclave, the Observatory says, and divided what remains into three shrinking pockets, each controlled by a different rebel group. The evacuation of rebels from Harasta could empty the smallest of these pockets and rack up the pressure on those controlling the two other to accept similar deals. Eastern Ghouta is within mortar range of central Damascus, and the evacuation deal could be a major step in the regime's efforts towards securing the capital. The one-month offensive on Eastern Ghouta has killed more than 1,500 civilians, the Observatory says. It has prompted tens of thousands to flee into government-held areas. More than 350,000 people have been killed in the Syrian conflict since it broke out in 2011 with the brutal repression of anti-government protests.